Foundation president-elect Juliette E. Lippman (left) and executive director Bruce B. Blackwell (right) receive a $70,000 cy pres award from the settlement of a suit won by attorneys Edward Zebersky (second from left), Valorie Chavin and Michael J. Higer. 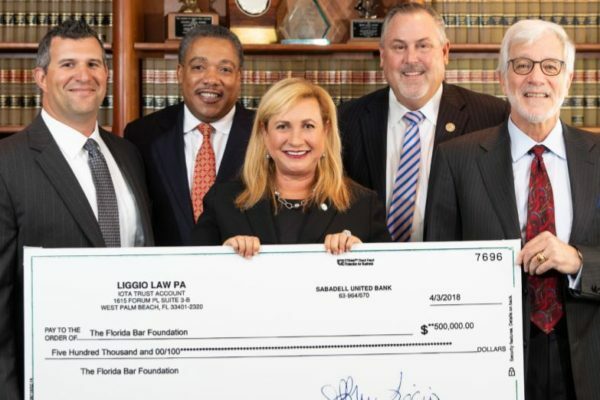 The Florida Bar Foundation has received a $70,000 cy pres award from a class action settlement in a case involving post-claims underwriting by an insurance company. Judge Martin Bidwell of the 17th Judicial Circuit in Broward County approved a $1.2 million settlement against Universal Property & Casualty Insurance Company and directed a portion of it to the Foundation. Judge Thomas Lynch, the previous judge in the case, had given initial approval for a cy pres award. Valorie S. Chavin of Chavin Mitchell Shmuely, Edward Zebersky of Zebersky & Payne, and Michael J. Higer of Berger Singerman represented the class. Post-claims underwriting is a practice in which an insurance company accepts premiums from insureds, sometimes for years, without taking simple steps to verify information on the insureds’ applications. The suit alleged that, after receiving a claim, the insurance company would then conduct an underwriting analysis it had not done in the first place and would void the policy “ab initio,” or from the beginning, so that it could effectively deny coverage based on purported “incorrect statements” in the applications. The term cy pres comes from the French, “cy près comme possible,” meaning “as near as possible.” The doctrine often is applied in class action cases where full restitution to all injured parties is impossible or infeasible, such as when the amount of damage per person is insignificant even though the aggregate damages are large. It also can be employed in probate matters when gifts fail, or in the area of charitable trusts. Under cy pres, the courts can approve a charitable donation out of unclaimed class action funds or a direct grant in lieu of damages to an organization that could vindicate class member rights in the future. Cy pres awards prevent a windfall for the defendant while serving to deter future violations.